Grazing Project Officer Scott Hickman highlighted just how important the benefits of group support through networking and information sharing at the recent Grazing Cluster Meetings held at Yass, Boorowa and Crookwell as part of the South East Local Land Services Grazing Management Project. Over three days more than 45 landholders met locally to discuss a range of topics including grazing management and planning, grass assessment, pasture biodiversity, improving soil health and planning for water infrastructure. Livestock management and health were also important with discussions had on pasture and fodder needs, mineral supplements, animal performance and parasite monitoring and control. The meetings were the first of two planned with each local group, with two large field days also scheduled. The projects aim is to form local groups of producers that can provide encouragement and support to one another during transition to best practice management. Key to the project, is its inclusive nature, bringing people together in a flexible learning environment in order to harness local knowledge and experience. Thirty nest boxes have been installed in the rail corridor between Cowra and Young as part of the John Holland Squirrel Glider Conservation Project. Lachlan Valley Tree Services expertly climbed and installed the boxes in a variety of eucalypts in a location where Squirrel Gliders were detected earlier in the year. Nest boxes play an important role in providing denning and nesting sites when there is a shortage of suitable natural habitat. All the nest boxes were constructed with rear entrances, which helps to discourage invasive bird species such as Starlings, and carpet has been attached to the inside of the lid to prevent European Bees attaching their hives. 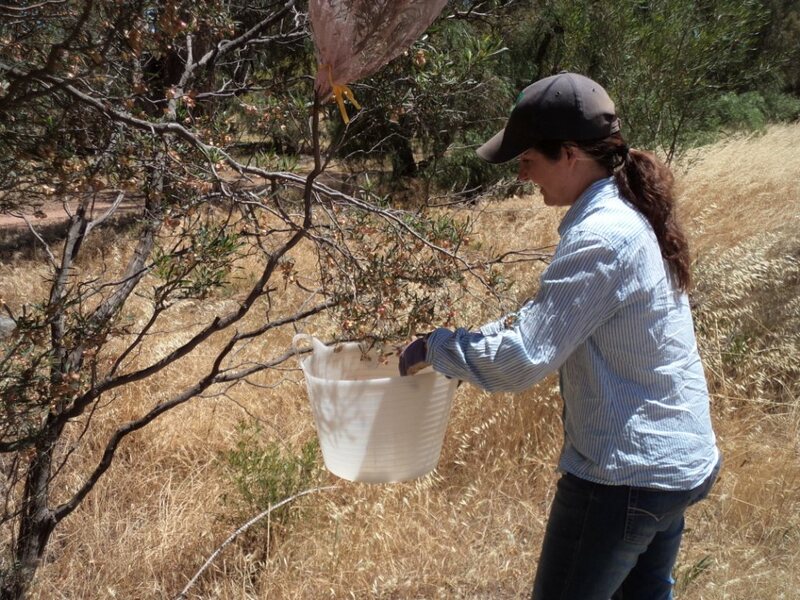 After a busy summer of identifying and collecting local seed from Acacia (wattle) and other native shrubs from roadside reserves and Travelling Stock Routes, propagation for the John Holland Squirrel Glider Conservation Project has begun. The seeds from almost twenty species of native plants were collected which were then cleaned and prepared for sowing into forestry tubes and trays. Once the plants are grown they will be planted at specially selected sites along the non-operational rail line between Cowra and Young to help improve habitat within remnant woodland vegetation by increasing the amount of forage plants for threatened Squirrel Gliders. Squirrel Gliders have a diet of nectar, pollen, insects, manna and Acacia gum, and some studies have found that one of the most important food sources for most months of the year, particularly during winter, is nectar and pollen from flowers of Eucalyptus and Acacia plants, making this portion of the project extremely important in sustaining the local Squirrel Glider population. Mid Lachlan Landcare is pleased to announce that our Grazing Project Officer Scott Hickman will be the facilitator for South East Local Land Services Grazing Management Project. The project’s aim is to engage with the communities of Boorowa, Upper Lachlan and the Yass Valley in order to support and improve knowledge and skills in sustainable land management practices and to assist land managers in implementing on-ground practice change. Scott is an experienced facilitator and mentor who aims to build confidence in land managers by providing encouragement and ideas within a flexible learning environment that is focussed on local, topical issues. The Grazing Management Project will enable Scott to coordinate a series of local group meetings and organise two major field days, while also providing mentoring and support to individuals. Stay tuned for project updates. Year 12 food technology and hospitality students from Brigidine College in Randwick spent three days this week touring the Cowra region learning about different types and scales of food production. Students were able to meet the farmers, ask questions and even taste their produce during a packed itinerary visiting a holistically managed sheep grazing property, an organic farm that specialises in wine, olives and figs, a high production vegetable farm, a dairy, olive processors and the Central Tablelands Livestock Exchange. Our local producers shared their knowledge and gave personal insights into how they’re managing their land and resources to improve productivity and farm health into the future. Mid Lachlan Landcare recently partnered with John Holland Country Regional Network to undertake threatened Squirrel Glider conservation works along the non-operational rail line between Cowra and Demondrille in Central West NSW. The project will provide additional denning and nesting sites using artificial nest boxes and will include planting of mid and understorey shrubs, particularly Acacia (wattle) species, to improve foraging resources. Seed is currently being collected locally from roadsides and remnants from Cowra to Monteagle. Spotlighting to detect Squirrel Gliders began a few weeks ago after site scoping identified a number of suitable locations. Then, one warm night during late November we hit Squirrel Glider gold! Two individuals were identified in the spotlight beam. This site will now be the focus of many of the on-ground works scheduled for early 2015. Watch this space! Mid Lachlan Landcare’s inaugural Eat Local dinner event held in Cowra last week was a great success, celebrating and bringing together a local network of sustainable producers that aim to improve their land while keeping their businesses productive and profitable. The Oxley Food and Wine Bar hosted the event, incorporating into their menu locally grown, grass fed lamb and beef. Guest speakers Andrew Wooldridge and Scott Hickman both provided inspiring talks that highlighted how important it is to value and respect our productive land and environment. Mr Wooldridge is an organic farmer from Canowindra and experienced soil scientist with the Department of Primary Industries. His talk provided a global context, giving the audience insight into how the human race throughout the ages have put continuous pressure on their lands to produce food and fibre often leading to deforestation, land degradation, erosion and an ultimate decline in living standards. Mr Hickman highlighted the important role regenerative agriculture has to play within our natural environment for the wider community through clean water and healthy soils. He talked about his personal journey in adopting holistic management and the positivity he’s experienced during his facilitation of a local grazing mentoring project called “Growing the Grazing Revolution”, which supports landholders during their transition to improved grazing management. The success of the evening wasn’t only about the great turnout. The positivity in the room was unmistakeable – the perfect combination of a group of passionate and dedicated locals within the relaxed atmosphere of The Oxley. Our spring Squirrel Glider surveys have just been completed with some new nests and beautiful gliders recorded in the nest boxes. Thanks to our volunteers this season – Marc and Dave, both Senior Threatened Species Officers with Office of Environment and Heritage, Tracee and Ruth from Kangarooby Landcare and Mikla from Young District Landcare. Thanks also to Maurice who showed off his climbing skills shifting nest boxes in some very large trees. Mid Lachlan Landcare and Young District Landcare collaborated recently for the Squirrel Glider Field Day held at Crowther NSW (between Cowra and Young). The field day coincided with National Threatened Species Day held each year on September 7th to commemorate the death of the last Tasmanian Tiger held in Hobart Zoo in 1936. A woodland nature walk at Clover Leigh Golf Club provided an engaging and beautiful location for the day where 120 students from five primary schools attended to learn about local threatened species including how a nest box program is providing alternative habitat for squirrel gliders, and how to identify and monitor superb parrots with the Office of Environment and Heritage’s threatened species team. Students also had an amazing up-close wildlife experience with the Zoomobile from Sydney’s Taronga Zoo.